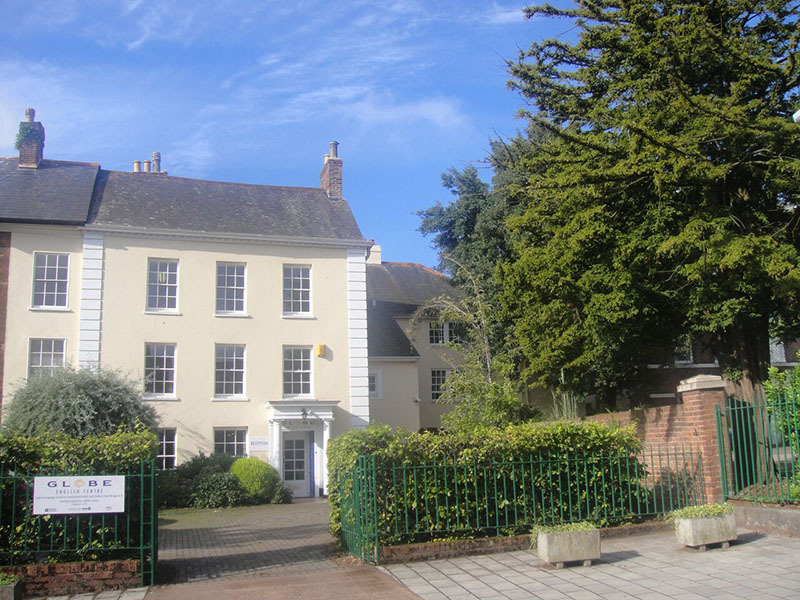 Learn English in Exeter at our partner school, The Globe English Centre. Located in a beautifully modernised 19th century building, The Globe offers excellent facilities to learn English and is surrounded by trees and gardens with lovely views over the Exe valley. In Exeter students can also find most sports available including tennis, golf, cycling, squash, canoeing, sailing and windsurfing. On the intensive course with 20 or 28 lessons per week you will develop your ability to communicate effectively in English. You will practice all four skills - listening, speaking, reading and writing - and expand your knowledge of vocabulary and grammar. The price quotation form does not include this surcharge automatically. The correct surcharge will be included on the invoice after booking. Accommodation with a host family includes a packed lunch from Monday to Saturday. A double room in a host family can be booked by two persons travelling together. Special dietry supplement (e.g. gluten-free): € 25 per week. Please indicate on the booking form if you like to apply for a special diet; the surcharge will then be added to the confirmation-invoice. Accommodation with an executive host family includes a packed lunch from Monday to Saturday. A double room in an apartment can only be booked by two persons travelling together. Apartment of families are available on request. The price stated here is for an airport transfer upon arrival and departure at/from Exeter Airport per peson when not included. The airport transfer on arrival/departure at/from Exeter Airport only is included in case you are staying with a host family. Prices for arrivals on Bristol or London airports on request. In 2019 the school is closed on the following dates: 01/01/2019- 04/01/2019, 19/04/2019, 22/04/2019, 06/05/2019, 27/05/2019, 26/08/2019, 23/12/2019-03/01/2020. Missed lessons due to bank holidays will not be refunded or rescheduled.When holidays fall on a Monday, the school will offer where possible English lessons on Friday afternoon. If you need to use English in business, this programme will help you to develop the necessary language for meetings, presentations, telephoning and other professional activities and allow you to take part in international business with more confidence. Required level for this course: intermediate to advanced a minimum age of 21. 20 lessons of general English per week plus 8 Business English lessons. You can start the Commercial English course twice a month, starting dates on request. The duration of the Cambridge exam course is 2 or 10 weeks. At the end of the course the Cambridge exam takes place. During the course you will follow 20 lessons on main programme plus 8 exam preparation lessons per week. An intermediate level of English at the start of the Cambridge exam course is required. The prices of the Cambridge exam course do not include the exam fees (approx. 140-150 GBP). Please, check the remarks on our price list with the dates available for each course and module. *1 week courses are only focused on methodology and do not include English lessons. Are you looking for an English course for your family in the south of England? The program for families in Exeter is, without doubt, a great option at any time of the year. While your children do a program for children from 7 to 10 years old or for juniors from 11 to 19 years old, you can take an intensive course of 20 lessons per week. The schedule of lessons for adults is from 9.00 to 12.30 with a break of 30 minutes at 10.30. Accommodation will be in a host family, on a full board basis (breakfast, lunch package and dinner). It is possible to book a private apartment (private apartment prices upon request). Young people and children have included a complete package of activities. The youngest ones (7-10 years old) must be brought to school by one of the parents and also collected at the end of the activities. Do you want to take an English course in England with the whole family? If so, we offer a program for families in Exeter, that you can start at any time of the year. In combination with the parents course, you can book a course for 11-19 year olds. Classes are normally taught from 9.30 to 13.00 (schedule subject to change). In Exeter, the school is located in the center of the city and has several buildings (two adjacent and one opposite) where classes are taught. One of the buildings is intended for adult classes and the others for young people and children. In this way, each of the participants of the family program enjoys a separate environment according to their age and can see each other at any time. As accommodation, it is possible to book a host family on a full board basis (breakfast, lunch package and dinner) and, after consulting prices, a private apartment. In combination with the parents course, you can book a course for children aged 7-10 years. Both courses are held in a school in downtown Exeter. Children of 7-10 years of age have 20 weekly lessons of English per week taught by teachers specialized in these ages. These are classes with games and a lot of communicative activities so that the little ones learn the language in a more fun way. With regard to the accommodation, you can book a host family on a full-board basis (breakfast, lunch package and dinner) or a private apartment. You can consult the prices for the private apartment by request. The youngest ones (7-10 years old) must be brought to school by one of the parents and also collected at the end of the activities. Attention: this course must be booked in combination with the parent course program. Minimum age is 7 years . The duo course allows participants to define their objectives to create an individual programme adapted to their level and learning pace. It is a class for two students. The duo course can only be booked by two people who travel together and have the same level of English. This course can only be booked by two people travelling together and who have the same level of English. This program gives you the opportunity to improve your English language skills while learning more about the English working world. To participate in this program, you must be at least 16 years old. The internship is unpaid. Usually you work from Monday to Friday from 09:00 to 17:00 clock (however, the working hours depend on the opening times of the industry). Sometimes it is also possible to combine a part-time internship with a language course. The duration of the internship may vary but has a minimum duration of 2 weeks. In 2018, the program will consist of a 2-week language course and a 1, 2 or 3-month internship (total duration of 6, 10 or 14 weeks, including your course). *Of course you can add more weeks of the language course and/or the internship on request. The prices for JobTravel apply for an intensive course of 1 week in combination with a 2, 3 or 4-week internship. The one-to-one course is based on your linguistic skills, professional or social needs and personal expectations. Flexibility is the main feature of this course. As the only student in class you decide the content of the course. The one-to-one course is recommended above all for students with only a short amount of time available. 15 hours per week. Shared apartments are available on the campus. The shared apartments are comfortable and pleasantly decorated. 3 or 4 students share each apartment where you can have a private room or a shared room. There is a fully equipped kitchen and a bathroom, central heating, TV/DVD and Fast Internet access ADSL in each apartment . All towels and bed linen will be provided for. All students are offered breakfast, packed lunch and an evening meal (full board). You will stay in a single or double room. All homes are within 25-30 minutes’ walk from the school or a free bus pass is given on the rare occasion families are located outside of this distance. The executive host families live in larger accommodations and are often more upper-class. You will stay in a single room with full board (breakfast, a packed lunch and an evening meal). You will be given your own keys and will be independent, but treated as a member of the family. All homes are within 25-30 minutes’ walk from the school or a free bus pass is given on the rare occasion families are located outside of this distance.